4X games (eXplore, eXtract, eXpand, eXterminate) have a long and illustrious history on the PC. The paradigmatic examples are probably Civilization and Master of Orion—turn-based empire-building games that ask you to juggle priorities while offering multiple paths to success. Do you emphasize technological advancement, military conquest or resource-procurement? Usually you combine two or more of these things, or concentrate on one for a while before moving to another. Several developers have managed to port the 4X experience to mobile, touch-based platforms—primarily iOS, but also Android. The platform is quite suitable, operationally speaking, but tablets don’t seem like a great cognitive fit for long and involved games with lots of menus and things to keep track of; tablets seem better suited for the new wave of 4X-inspired games like FTL: Faster than Light (Buy), which emphasize elements or aspects of 4X gaming but tailored to produce a more targeted experience, as well as shorter games that can be played to conclusion between tasks, in waiting rooms or on the go. This is what tablet gaming is made for. Out There is rooted in the 4X experience. Like FTL, it uses Master of Orion more as inspiration than template, a setting for its taut story of survival against all odds. 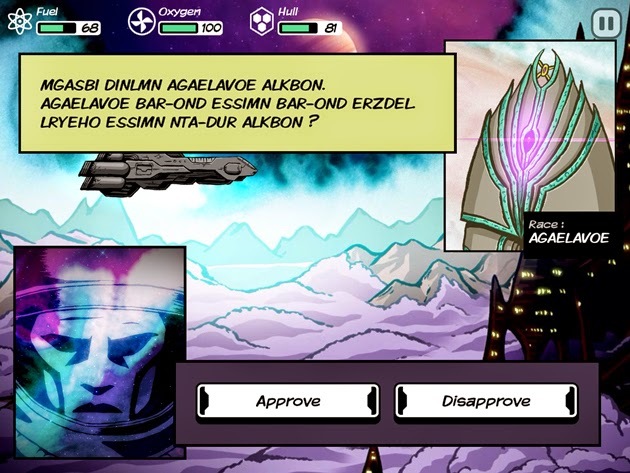 Both games take place in procedurally-generated galaxies, ensuring that every game played is sufficiently different from the last. And Out There can be just as unforgiving as its predecessor, yet similarly manages to parlay intense difficulty into an addicting, rather than frustrating, experience. But whereas FTL emphasizes combat and tactical personnel management, Out There is all about resource management. You are a lone spaceman whose ship has drifted far from Earth. You must find a way back, but the galaxy is an inhospitable place. You need fuel (hydrogen and helium) to move, air (oxygen) to breathe and materials (iron) to keep your ship from breaking apart. First and foremost, you’re going to need to find planets to mine for these elements. Here’s the problem, though: jumping from solar system to solar system and from planet to planet in order to extracting these essential elements costs fuel, oxygen and iron. And the ship you’re given in the beginning is a fairly insubstantial thing, prone to taking big hits every time you approach a fuel-rich gas giant. So you mine rocky planets for iron, which costs fuel and oxygen. Oh, and did I mention that you never really know how much iron a gas-giant will cost you, or how much fuel you’ll find in return? Now you can see the kinds of tough decisions Out There forces you to make, often boiling down to a roll of the dice, as it might in a real survival scenario. While you can try to make it back to Earth just managing these four elements and skipping everything else, you probably won’t make it that way. And it’s much more fun if you explore. Garden planets give you the chance to fill up on oxygen and encounter the galaxy’s various alien species. Most are friendly, and if you answer their questions appropriately, they may share technology or the omega element, which can be used for fuel, air or material, or to power a number of unique technologies, like wormhole generators (used to instantaneously travel from one black hole to the next) or life seed, which terraforms rocky planets. Along the way you learn to speak their language, which makes subsequent communication easier. 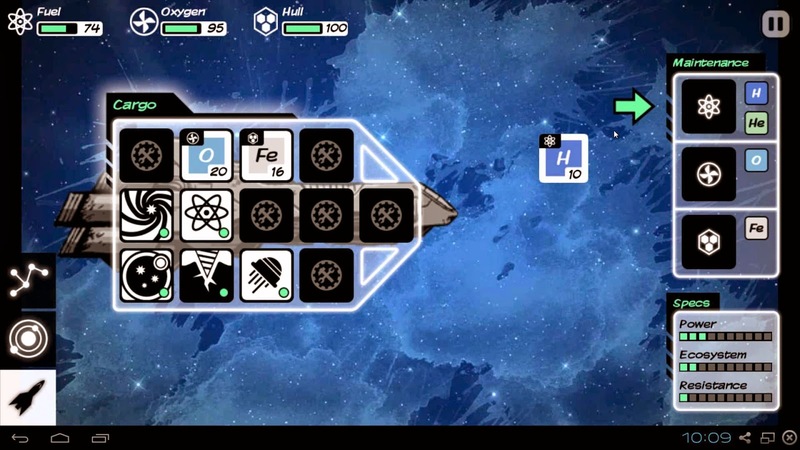 The galaxy’s more exotic elements, like gold, hafnium or cobalt, can be used to produce the useful new technologies you discover along the way, like the shield generator (which lowers the damage your ship takes), solar sail (which lowers the fuel used to travel between systems) or gravitational well generator (which expands the distance you can travel). You will also find derelict ships to take over, randomly placed supply stations to use and various galactic mysteries to engage or avoid, since only some will work to your favor. There are multiple endings, depending on the path you take, and multiple strategies to get you there. Most of the time something will go wrong. But you’ll just pick yourself up and start anew—it’s that kind of game. 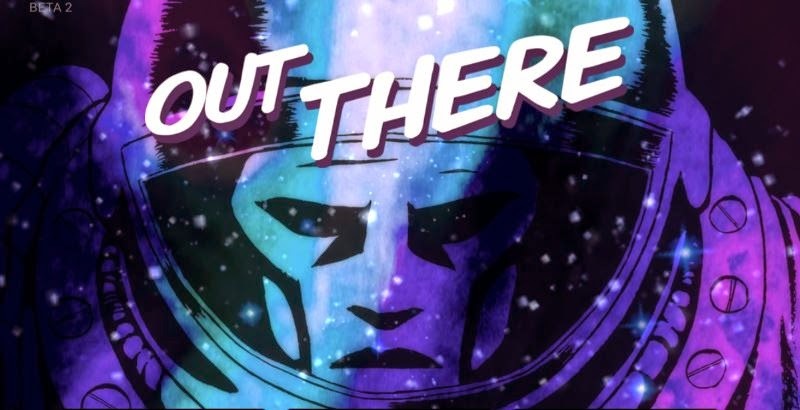 Out There is also strikingly beautiful, marked by an appealing comic art visual style and warm ambient electronic soundtrack that amplifies the game’s palpable sense of wonder. It’s more stylized than FTL; ultimately, though, that’s only a small part of why I think it’s the more impressive game. A bigger part is the lack of violence. That’s not to say I have a problem with violence in video games (a few extreme cases aside). But I’ve been thinking a lot about how much popular art relies on violence; this is especially true of video games, and even more so when specifically considering science fictional video games. Yet for someone raised on science fiction literature, this imbalance is more than a bit odd—many of the most famous SF stories don’t involve war or combat or the spilling of intestines to be compelling. (Don’t believe me? Read Childhood’s End or Ubik or The Left Hand of Darkness.) Out There presents a taut, compelling and thoroughly addictive tactical strategy game experience that doesn’t rely on violence or the threat of violence in order to be any of those things. I find that incredibly appealing, and while I do still enjoy FTL, I’ll be spending most of my time in Out There’s virtual galaxy for the foreseeable future. Bonuses: +1 for insanely addictive gameplay and appealing visual and auditory style; +1 for being that rare SF-themed game that doesn't rely on violence to be compelling. Penalties: -1 for unlike the amplifiers in Spinal Tap, our scale doesn't go up to 11. Read about our scoring system, and why 10s like this one are so damned rare.